June 1, 2009, Department of Homeland Security Secretary Janet Napolitano selected a TSA facility to unveil the DHS Efficiency Review initiative, a major program to improve efficiency and streamline decision-making through a series of agency-wide initiatives. Secretary Napolitano outlined the plan at TSA's state-of-the-art Transportation Systems Integration Facility at Ronald Reagan Washington National Airport, where TSA tests new explosives screening systems - to be funded with $1 billion from the American Recovery and Reinvestment Act - before being deployed to airports around the country. "This very facility is a great example of efficiency at work," said Secretary Napolitano. "I am committed to creating a new culture of efficiency at the Department of Homeland Security, and the Efficiency Review will allow us to cut costs while streamlining operations and decision-making. Over time, this will make DHS a leaner, smarter agency better equipped to protect our nation." Since its inception, TSA has been testing and evaluating new technologies and screening procedures at airports around the country. Unfortunately, onsite pilot programs have a number of logistical and budgetary limitations. 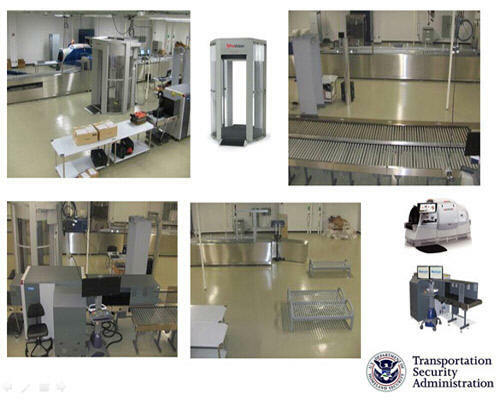 The Transportation Systems Integration Facility, or TSIF, promises to virtually eliminate these limitations and inefficiencies by allowing TSA to examine technologies and screening procedures in a realistic airport environment. Ultimately, the TSIF will become a staging area for pilot programs before they are tested at an actual airport. By discovering and eliminating inefficiencies from technology before they are implemented at airports around the country, TSA will save time and money, and certainly cut down on passenger inconvenience. The newly renovated 128,000-square-foot, two-story test facility was recently acquired from the United States Post Office under a 10-year lease. It can accommodate nearly 140 TSA employees and contractors. The first floor of TSIF boasts a fully operational in-line baggage screening system, complete with a central control room and several different types of Explosive Detection Systems and alarm resolution areas. Laser grids, photo-eyes, and baggage tag readers line the conveyor belts, allowing the control room to zoom in on any bag at any time. An enormous room adjacent to the in-line system is designed for cargo testing - and not just air cargo. Various methods of screening maritime, rail and all other land-based cargo will be tested at this facility in the near future. The second floor contains a fully operational security checkpoint with a full complement of AT X-ray, Auto EDS and WBI machines. Eventually, TSOs will take turns staffing the checkpoint as mock passengers play out certain scenarios.